These ""Love is Sweet"" sweetheart towel cakes are worth doing a double take. What seems like a delectable dessert is actually two beautifully folded and decorated hand towels! Carefully crafted to resemble a sweetheart cake, this favor is the perfect accent to a chocolate lover's wedding, bridal shower, or baby shower. 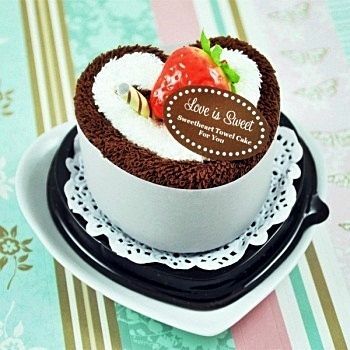 Made of 100% cotton, these towel "cakes" are topped off with faux wafers and decorative strawberries, and then finished with a message that reads "Love is Sweet." This beautiful and practical wedding favor rests on top of a doily and comes packaged in a clear heart-shaped box with brown base, ready to adorn your reception tabletops.